In 1978, the National Center of State Courts selected the Seattle program as the "best national example of citizen participation in the juvenile justice system." This recognition, along with a grant from the Edna McConnell Clark Foundation of New York City (one of CASA's earliest and strongest supporters), resulted in the replication of the Seattle CASA program in courts across the country. By 1982 it was clear that a national association was needed to direct CASA's emerging national presence. The National Court Appointed Special Advocate Association was formed that year. By 1984 the National CASA Association had received financial support from several significant sources: a grant from the National Council of Juvenile and Family Court Judges, under the direction of the U.S. Department of Justice, Office of Juvenile Justice and Delinquency Prevention; funding from the U.S. Department of Health and Human Services; and two one-year grants from the Edna McConnell Clark Foundation. The Association opened its national headquarters office in Seattle, Washington, in the summer of 1984, and launched a membership and fundraising drive. On April 22, 1985, President Ronald Reagan presented the National CASA Association with the President's Volunteer Action Award for "outstanding volunteer contribution, demonstrating accomplishment through voluntary action". National CASA has also received support from the Kappa Alpha Theta Foundation since 1989. This international women's fraternity selected CASA as its philanthropy and has provided funds for a variety of projects, including start-up grants and a public awareness video. In August of 1989, the American Bar Association, the country's largest professional organization of attorneys, officially endorsed the use of CASA volunteers to work with attorneys to speak for abused and neglected children. In July of 1990, the National Council of Juvenile and Family Court Judges named CASA "Outstanding Volunteer Program" in America's juvenile and family courts. Also during that year the U.S. Congress authorized the expansion of CASA with the passage of the "Victims of Child Abuse Act of 1990"(P.L. 101-647), so that a "court-appointed special advocate shall be available to every victim of child abuse or neglect in the United States that needs such an advocate." In July of 1991, the Office of Juvenile Justice and Delinquency Prevention, U.S. Department of Justice, named CASA an "Exemplary National Program in Juvenile Delinquency Prevention". In December of 1992, David Soukup, founder of CASA, was recognized with an award from the Caring Institute of Washington, D.C. Also in 1992, Congress initiated funding of a grant program to expand CASA representation of abused and neglected children. 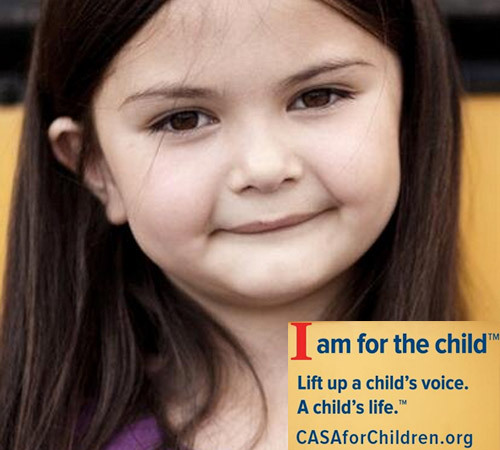 In April 2001, the National CASA Association helped the millionth child since CASA first started in 1977. Today, the National CASA Association represents over 950 CASA programs across the country in every state, including Washington, D.C. and the U.S. Virgin Islands. It provides support for starting programs, technical assistance, training, and fundraising, media, and public awareness services.